Davis Bynum is a venerable name in California Pinot Noir having made their reputation back when Joseph Swan was still with us. Founded in 1973, Davis Bynum was the first to produce a single-vineyard Pinot Noir from the Russian River Valley; from the now legendary Rochioli Vineyard. And this heritage lives on even after the sale to Rodney Strong Vineyards in 2007. From this tasting, and a time or two in their tasting room, the wine in the bottle continues to live up to their well earned reputation. 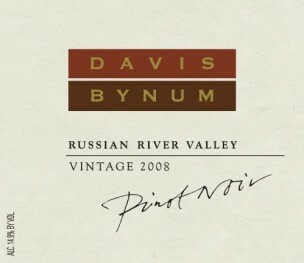 Davis Bynum, Pinot Noir, Russian River Valley 2008 ($35/sample) – Dark garnet in color with aromas of black cherry, earth, sage and fennel. Tight raspberry fruit flavors with nutmeg and a mineral note finishing with moderate tannins. Needs a bit more time in the cellar to come around or 2 hours in a decanter. Wines in the “fighting varietal” section of the wine store don’t get a lot of wine blog love. Nor do they get reviewed very much in the mainstream wine press leaving the inquiring consumer to consult Google for information. And I get a lot of incoming search traffic every time I review such a wine. But I’m not reviewing this wine for the traffic but because it surprised me at how drinkable an industrial California $5 wine can be. Glen Ellen as a fighting varietal brand has been with us since the mid-1980’s producing a number of different wines available mostly in 1.5 Liter bottles. But it has been only recently that they have been relaunched as a sort of second label of Concannon Vineyards, the first producer of varietal labeled Petite Sirah. And judging by this effort, some of the winemaking practices for the variety have rubbed off. 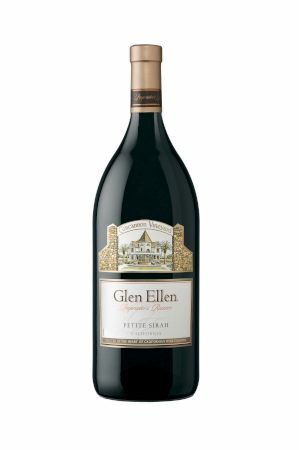 Glen Ellen, Petite Sirah, “Proprietor’s Reserve” 2007 – ($10/1.5 Liter/sample) – Ruby-purple in color with aromas of blueberry and strawberry. Bright blueberry and plum flavors with a nice red fruit finish and no tannins. A fruit bomb a lot of people will like and a terrific value. Since today is Valentine’s Day I thought I would post a romantic wine. Red Burgundy is world-renound as a silky and feminine wine of grace and balance. And Pinot Noir is the variety of red Burgundy which has been transplanted all over the wine world. California Pinot Noir has come a long way in a relatively short period of time producing some world-class wines. But due to the popularity of the variety since the success of the movie Sideways, finding top grade Cali Pinot for less than $25 a bottle has been tricky. Rodney Strong has a well established track record for their Cabernet and Merlot based wines but I can’t remember if I’ve ever tasted a Pinot Noir from this producer. But they have been making the variety for a number of vintages from their vineyards in the Russian River Valley where their winery is located. And they did purchase venerable Pinot producer Davis Bynum 5 years ago. So I was surprised to learn that founder Rod Strong had been one of the first to plant Pinot Noir in the Russian River Valley back in 1968. Such foresight makes this wine no less surprising for it’s level of quality at a bargain price. 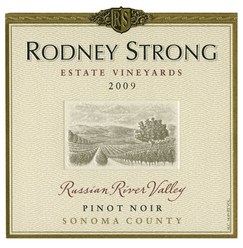 Rodney Strong, Pinot Noir, Russian River Valley “Estate Vineyards” 2009 ($20/sample) – Ruby in color with aromas of strawberry, black cherry, forest floor and fennel. Bright cherry and strawberry fruit finishing with fine tannins. A delicious Cali Pinot that I think will get more interesting with a couple more years of cellaring or decant for a couple hours now. An exceptional value for $20 or less on sale.